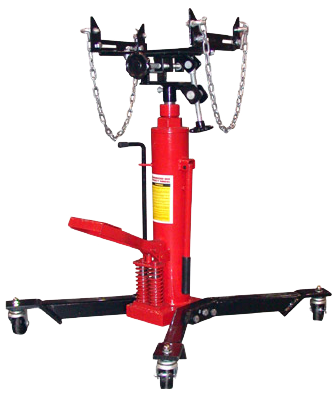 The T-1000M Manual Commercial Transmission Jack is the same jack used in many professional transmission shops throughout the United States. It’s operated by a foot pump. It features a 1,000 lb capacity, 1st stage lift height of 53″ and 2nd stage lift height of 71.25″. LIFT HEIGHT - FULLY LOWERED 34.25"
LIFT HEIGHT - 1st STAGE 53"
LIFT HEIGHT - 2nd STAGE 71.25"